"The taste that's full of surprises!" 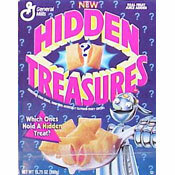 The front of the cereal box described Hidden Treasures as a "crunchy and sweetened corn cereal - some with artificially flavored fruit centers" and asked the question, "which ones hold a hidden treat?" "Thing aren't always what they seem. 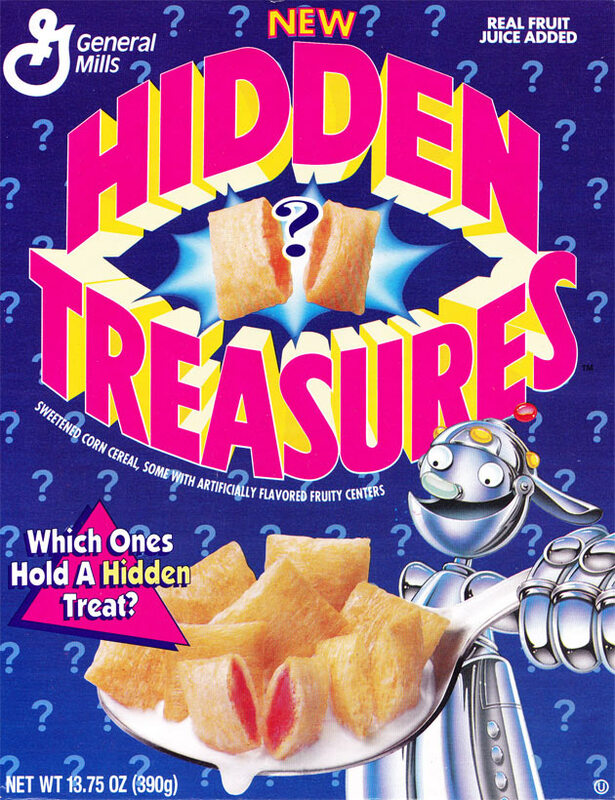 Take Hidden Treasures cereal... every square looks the same... sweet, crunchy, right? But certain ones have a taste of fierce, fruity frosting inside. Some got it. Some don't. Some blast ya. Some won't. Hidden Treasures... the cereal that's more than it seems." 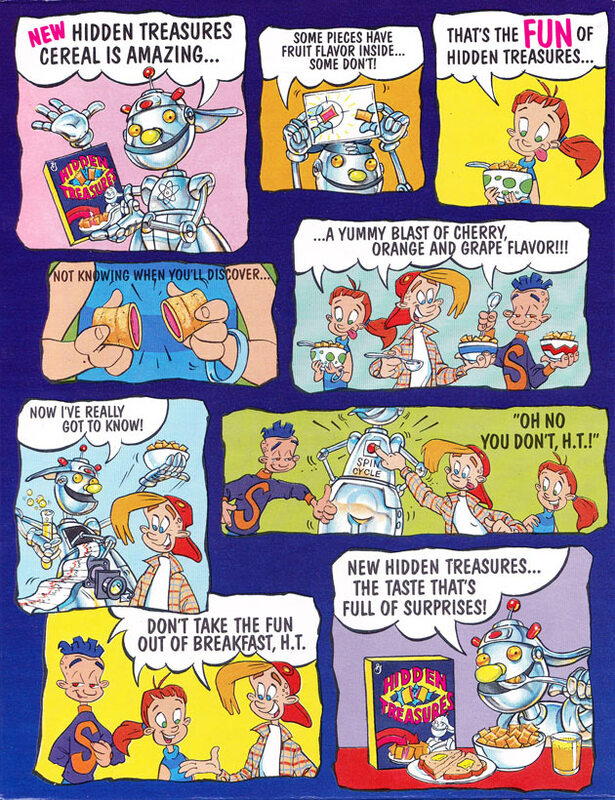 The mascot for Hidden Treasures was a robot named H.T. who appeared to have an inverted metal cereal bowl for a hat. On the introductory box, the side panel included the following text under the headline "HT's Out Of His Mind For Inventions!" "H.T. 's researching fun inventions in hopes he'll be inspired to invent a way to discover which Hidden Treasure pieces have the fruity filling. Can you help him match the fun invention to the description of how it was invented." Then there were four short paragraphs describing the inventions of the bowling ball, Silly Putty, the Slinky and roller skates. 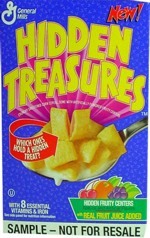 "New Hidden Treasures Cereal is amazing. Some pieces have fruit inside... some don't! That's the fun of Hidden Treasures... not knowing when you'll discover a yummy blast of cherry, orange and grape flavor. New Hidden Treasures... the taste that's full of surprises!" The first 7 items in the very long list of ingredients were corn meal, corn flour, sugar, partially hydrogenated vegetable oil, corn syrup, salt and grape juice. What do you think of Hidden Treasures? View all 62 comments for this cereal. This was one of my favorite cereals. I still crave it sometimes in my adulthood. I would take an off-brand version of this, too. This tasted really good as I recall. Very satisfying. The 'mystery' aspect failed though... I distinctly remember you could tell the flavor based on whether the seam on the piece was in the center, off-center, or near the edge. Oddly enough, I remember that yet I don't remember there being non-filling pieces. This is definitely the best cereal I have ever tasted in my life (that went away). And I only had it 2 times. Both times were at a sleepover. You know, I have noticed that a lot of you say that you couldn' remember the name and that you have been looking for it for years. If you really loved it like I do, you would've never forgotten the name. I could never forget the name of something so life changing. I remember begging my mom and dad to get me this cereal. Why I ever begged I'm not sure.... lol :p I thought this was one of the nastiest cereals I ever tried. I don't even think we ever repurchased it. Lol. I don't think it was sold for very long either. I have been saying for the last 15 years that I would give all of the money in my bank account for one box. 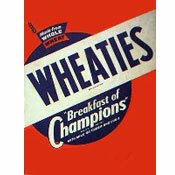 It was my favorite cereal back then and I still have dreams about it. I cried when they took it off the market. OMG me too. I've been trying to remember the name and no one ever knew what I was talking about and then the other day it just popped into my head! I think I was 6 when this yummy treat was gone for good! Feed My Hidden Treasures Need GP! I would take a life, for a box of this cereal... General Mills, I will be your hit man and you can pay me in Hidden Treasures. I will pay handsomely for an unopened box of this cereal.